It’s autumn — harvest season — which means that it’s time to harvest the FAM Festival in Downtown Windsor this weekend. 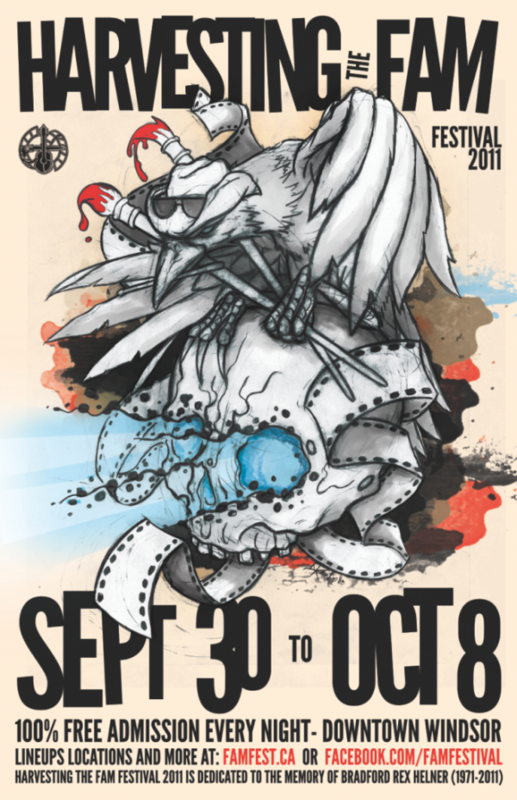 Harvesting The FAM is Windsor Ontario’s “largest independent inter-arts festival” created to promote and develop independent Film, Artistic and Musical talents in any medium or genre. Entrance is FREE for fans and creative talents; the festival creates a positive, open-minded space, for an array of artists to exhibit, promote, perform and sell their works. Tonight’s performers include The Vaudevillianaires, Surdaster, the Sean Connery Super Group, Dead Letters, What Seas What Shores, Salt Of The Chief Cornerstone, The Hypnotics, Orphan Choir, Sagan Youth and Attention. For more on FAM Fest, see windsoriteDOTca’s Lauren Hedges’ preview of the Festival.